Tagged under Yoshimizu Kagami, Kyoto Animation, Series, Light Novel. Follow the every day lives of Konata, Miyuki, Kagami and Tsukasa as they go through high highschool, homework, video games, and everything in between. This is where the things are starting to get really interesting. Let’s talk how the anime is actually shown, because it is very unique and different among any other there. There are similar anime and styles, but this one actually has a quality to it. This anime catches on slowly. It doesn’t hurry with anything. You have to accept it like that and while it might be slow to some, to others and me personally I think that it means that it is quite relaxing and also how some anime should be. Watching this you will not want to finish it fast. No, you will actually want to that it goes as much as possible. Now here is one thing that you all have to remember. Lucky Star really is funny and by that no doubt it will take you in it. What it also offers is not only comedy, but knowledge as well. I heard there was a second season of this. I never got to seeing it so I can't say I fully watched this then. Slice-of-Life Anime bores me unless it had really good gorgeous eye-candy to pay attention to. A must watch for all those who call themselves "otakus". Konata is one of the best characters I've ever seen, she's great and most of the comical situations are caused by her and her strange ways. I recommend it a lot. I still can't believe that I sat through 5-10 minutes of girls explaining how they eat some kind of croissant... and I can't believe that I actually *enjoyed* it, either! It was hard to think that this would make me laugh so hard, and still, it did! I kind of dropped Lucky Star along the way, though, but I intend to finish it one day. I just loved this show. It is so funny, inspirational, entertaining and fun overall. If you are looking for a comedy, something that will connect to your own otaku-ness and something that feels like a parody to it all, then go for this. You will either love it or not like it, but hopefully the first one. one of my top 10. a story about nothing yet just about everything in life is mentioned. great leading characters. seiyuu absoluately fabulous, much life and emotions come through their voices. the two side-kicks at end of the each episode is another reason why this anime is great. it's like having two anime in one episode. they sometimes interact but maybe view as separate. their concert included a live performance of voicing their own characters. it rocks. Lucky ? Star is basically OTAKU 101.... anybody who has a minuet amount of interest in Anime or Manga... this is the Anime/Manga to watch. 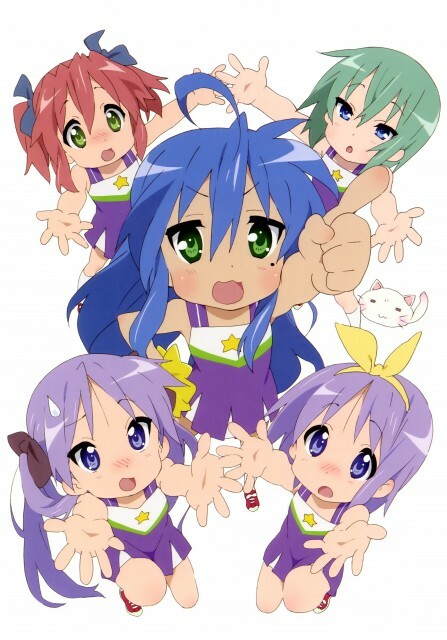 It follows Konata and her daily life as an otaku, along with Kagami, Tsukasa and Miyuki... whether in the classroom, summer break or work time, the conversations that ensue revolve around a bunch of random topics and Anime/Manga parodies. Bottom line the funny quirks, blunt forwardness and Dark Akira-sama's outbreaks in the end of the show make it worth the watch plus that little extra Motteke! Sailor Fuku! dance routine is something to look forward to as well. Although the anime has NO storyline it is incredibly funny and catchy. There is hardly any scene without comedy, jokes, word games or anime parodies and that is what makes Lucky * Star so special. A pleasant, relaxing, often hilarious slice-of-life that never gets too serious. One of the most addicting OPs ever that you WILL learn how to dance. I really wish my hair was as long as Konata's. Occasionally very touching. Art is simple but good-looking, very, very cute. Konata is an awesome character. This show is realllly funny. XD well, i heard in the manga, that 2 of the girls become lezbians and i was like...ewwww! but besides the pervy stuff that happens in manga (depending on wat kind of pervy it is becuz sometimes its sooo freakn funny!) its really good. u kinda have to have the right kind of humor for it though, or u might find it boring. but, i give it a 8. The comedy and slice of life is really well done. I really like the shifting of scenes in which they get direct to the point about what their topics are. They can turn trivial (for some, not for me) matters into a big one. Two thumbs up! Five Star! 10 out of 10 ranking for me! If you're really an otaku, you should definitely watch this one! I had trouble to get through the first few episodes since it's so different than other anime in my opinion. Talking about daily and common things in life. Changing the topic of the episode 5 times since it's short talks about a subject. But Damn!! I had so much fun watching this. I wanted more after the last one. So many recognizable stuff that might not seem funny but get funny when they point it out. The karaoke ending with dragonball song Sha-la killed me!! re watched it multiple times.